Despite clear advances in decreasing postoperative mortality below 4% after pancreatic resections in experienced centres, specific morbidity according to standardized definitions still remains high. While some recent multicentre studies have reported on complications after pancreatic surgery in Austria, detailed outcome data from single high-volume centres over longer time-periods are scarce. 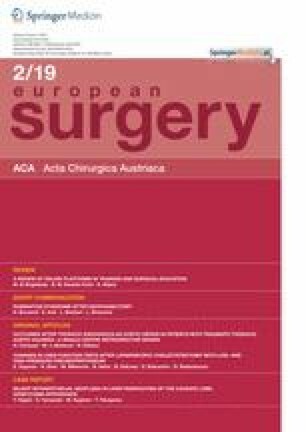 This study provides an in-depth picture of patient characteristics, indications, morbidity and mortality after pancreatic surgery in an Austrian tertiary referral centre. All patients undergoing curative intent resection between 2010 and 2017 at the Medical University of Innsbruck were evaluated. Patient characteristics and procedural details, overall and specific complications including postoperative pancreatic fistula (POPF), delayed gastric emptying (DGE) and post-pancreatectomy haemorrhage (PPH) rates according to accepted definitions are reported. Outcomes after pancreatic head resections, distal pancreatectomy and other types of resections are compared. Factors associated with severe and overall morbidity are evaluated by logistic regression modelling. A total of 343 patients underwent pancreatic resection, at a median of 64 years (53% males). Most common indications were pancreatic or bile-duct carcinoma (52%), benign/precursor lesions (22%) and neuroendocrine tumours (11%). The 90-day mortality was 2%; 90-day overall/severe morbidity was 66.2%/22.4%. POPF grade B/C occurred in 19.3%, PPH in 17.5% and DGE in 14.3%. Male gender was associated with severe morbidity, body mass index and procedures other than distal resections with overall morbidity. POPF and PPH were major causes for relaparotomy. Pancreatic resections in our centre are performed with low mortality, although morbidity still represents a relevant clinical problem, especially POPF and PPH. In-depth analysis of all consecutive pancreatic resections over 8 years in an Austrian high-volume centre. Postoperative 90-day mortality was 2% in this time-period, ranging amongst state-of-the art units worldwide, compared to 7.5% in-hospital mortality nationwide in Austria (in 2017). In our department, a low failure-to-rescue rate of 2.2% was achieved, although meticulous documentation revealed a high postoperative morbidity of 66%. Postoperative pancreatic fistula and haemorrhage represent the major challenges in terms of severe complications after pancreatic surgery and their sequelae are the main reasons for relaparotomy, readmission and failure to rescue. Mortality following pancreatic resection (PR) has decreased over the last decades with current rates ranging between 2 and 6% in high-volume centres. In contrast, morbidity in this surgical field still remains high, and increases depending on the type as well as complexity of the surgical intervention with overall complication rates of up to 60% [1, 2]. Major morbidity and associated sequelae occur in up to 30% and are mostly related to specific complications typical for pancreatic surgery including postoperative pancreatic fistula (POPF), delayed gastric emptying (DGE) and post-pancreatectomy haemorrhage (PPH) . In order to enable international comparability, many different classification systems for these aforementioned specific complications have been proposed. Hereby the definitions established by the International Study Group of Pancreatic Surgery (ISGPS) have gained broad acceptance especially in experienced centres [3, 4]. According the ISGPS definition, POPF develops in 10–15% of patients after pancreatoduodenectomy (PD) and in 10–30% of cases undergoing distal pancreatectomy (DP) . DGE after PD is seen in 20–50% of all patients and PPH develops in 4–16% of patients after PD and in 2–3% after DP (; Table 1). Early recognition and adequate management of potentially lethal complications represents the major challenge. In this context, centre volume has been identified as a factor of crucial importance, whereby increased surgical experience as well as availability of multidisciplinary approaches towards complication management helps to prevent failure to rescue (FTR) and consequently death [5, 6]. Most recently available, official nationwide postoperative mortality rates after pancreatic surgery in Austria from 2017 are displayed in Fig. 1 . In summary, for a total population of 8.8 million, 60 hospitals performed any type of pancreatic procedure, and the nationwide in-hospital mortality was 7.5%. The median number of procedures was 10.5 (range 1–96), and 38 hospitals performed less than 20 procedures, 9 hospitals between 20 and 29 procedures and 13 units at least 30 procedures. The in-hospital mortality rate in departments performing less than 10 pancreatic procedures per year was 12% compared to 8.1% in those with 20–29 procedures and 5.8% in hospitals with at least 30 procedures. Regarding publications on detailed postoperative mortality and morbidity after PR in Austria, multicentre data were recently reported in one prospective trial and two retrospective registries on pancreatic cancer and neuroendocrine tumour resections [8, 9, 10]. These publications all included only medium- to high-volume centres, with a resulting postoperative 30- to 90-day mortality of 2.4 to 3.5%, showing that pancreatic surgery in specialized Austrian units is performed within internationally accepted safety range. However, detailed analysis of indications, types of resections and postoperative morbidity and mortality over a long time-period from single high-volume centres may help to further define areas for potential improvements [11, 12, 13]. Thus, we aimed to analyse 90-day morbidity and mortality of patients undergoing PR at our institution and to compare these outcomes with nationwide results and international outcomes published in the literature. Furthermore, we intended to identify potential parameters including patient characteristics and comorbidities, indications as well as technical aspects of surgery, which may indicate patients at higher risk for postoperative complications. All patients undergoing PR between 2010 and 2017 at the Department of Visceral, Transplant and Thoracic Surgery at the Medical University of Innsbruck were evaluated. Exclusion criteria were: patients who did not undergo resection after exploration, cases with pancreatic biopsies only, duodenal malignancies without need for pancreatic resection, and patients receiving palliative procedures such as gastroenteric bypass surgery. Patients with chronic pancreatitis were included when the procedure included removal of pancreatic parenchyma (such as Frey’s procedure or resection of chronically infected pseudocysts). Analysis was conducted from our institution’s auditable database on pancreatic surgery, which has been retrospectively recorded from 2010–2015 and prospectively from thereon. The database ethics protocol was reviewed by the ethics committee of Medical University of Innsbruck (AN2016-0128), waiving the need for individual informed consent. The following parameters are reported in this study: patient characteristics including age, body mass index (BMI), American Society of Anaesthesiology (ASA) scoring, pre-existing diabetes, history of cardiovascular disease (coronary heart disease, myocardial infarction, severe carotid stenosis or peripheral arterial disease), pulmonary disease (chronic obstructive pulmonary disease, asbestosis, etc. ), metabolic diseases (metabolic syndrome or untreated thyroid disease), previous history of or ongoing smoking and alcohol consumption, previous other malignancies or surgery. Surgical details included indication for surgery, type and extent of surgery including vascular and other organ resection, postoperative morbidity and mortality (in-hospital and 90-day). Pancreatic fistula is defined according to the International study group for pancreatic fistula (ISGPF) 2005 classification, DGE according to the ISGPS 2007 definition and PPH according the ISGPS 2007 classification [14, 15, 16]. Postoperative 90-day mortality was validated with the official national mortality registry of Statistics Austria . FTR was defined as the number of patients who died from complications divided by the number of complications as previously e.g. reported by Tamirisa et al. . Patients who died from rapid disease progression within 90 days were not included in FTR calculations. Patient characteristics and surgical details are presented as numbers with frequencies (%) or medians with standard deviation (SD). Differences in numbers and types of procedures per year were assessed using the χ2 and Fisher’s Exact Test. The Kruskal–Wallis test and χ2 and Fisher’s Exact Test were used for comparisons between outcomes of the three different groups of procedures (PD versus DP versus others). To estimate the risk of different clinical and procedural factors for occurrence of severe or overall complications, univariable and multivariable logistic regression was performed with the enter method. P-values <0.05 were considered significant throughout all analyses. SPSS version 21.0 (IBM Corporation, Chicago, IL, USA) was used for statistical calculations. In total, 343 patients underwent pancreatic resection between 2010 and 2017 in our institution. Patient characteristics, indications for and type of surgery are summarized in Table 2. The median age was 64 years (SD 13.9) and 53.4% of patients were male. The most common indication were malignant tumours (pancreatic carcinoma or distal cholangiocarcinoma; 51.9%) and benign indications (22.2%), which included benign cystic or precursor lesions (pancreatic intraepithelial neoplasm [PanIN] 17.2%) other than IPMN and chronic pancreatitis (5%). Regarding comorbidities, 11 (3.2%) and 53 (15.5%) patients had pre-existing type 1 or type 2 diabetes, respectively. A total of 137 patients (39.9%) presented with any type of chronic metabolic disease, 197 (57.4%) with cardiovascular disease and 68 (19.8%) with pulmonary disease. Active smoking was reported in 103 (30.4%) cases. Alcohol consumption was declared as occasional by 116 patients (34.5%) and as regular/abusive by 24 patients (7.1%). About 20% (n = 69) of patients had experienced previous other malignancies and 169 patients (49.3%) had undergone previous abdominal surgery. 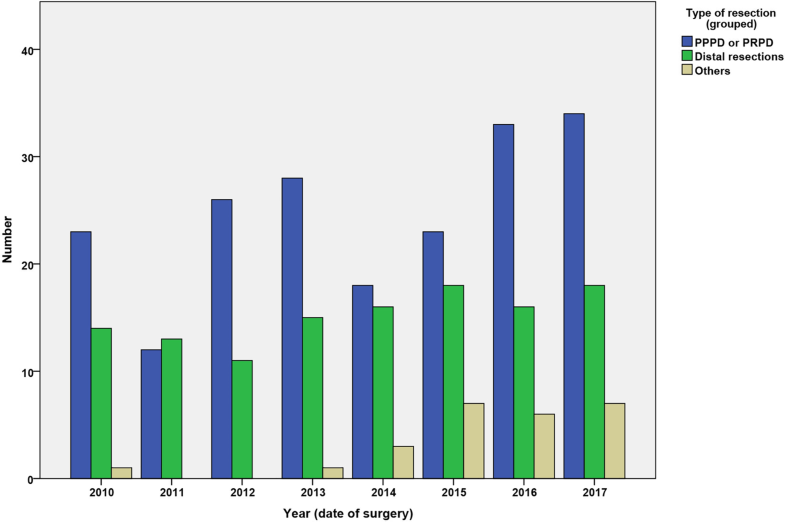 The number of resections per year increased over time from n = 38 in 2010 to n = 59 in 2017, as did the rate of laparoscopic procedures (0 to 10.2%; p = 0.023). Most frequently a PD was performed (57.4%), followed by DP (with or without splenectomy; 35.2%; Table 2). The numbers of different types of surgical procedures per year are displayed in Fig. 2 (PD versus DP and others). Vascular resections were performed in 44 (12.8%) patients (19 arterial and 31 venous resections). Concurrent (partial) resection of additional organs other than the spleen was conducted in 50 patients (14.6%), most commonly involving the gallbladder, liver and stomach. Overall, postoperative complications within 90-day occurred in 227 patients (66.2%), with 22.4% of patients (n = 77) having severe complications (>3a). Detailed frequencies according to the Clavien-Dindo classification were as follows: grade I: 31 (9%); grade 2: 67 (19.5%); grade 3a: 52 (15.2%); grade 3b: 43 (12.5%); grade 4a: 23 (6.7%); grade 4b: 5 (1.5%); grade 5: 6 (1.7% = in-hospital mortality). Relaparotomy was required in 51 cases (14.9%). The 90-day mortality was 2% (n = 7) and causes of death were multiorgan failure (n = 4), rapid disease progression (n = 2) and cardiac decompensation (n = 1). No significant difference regarding 90-day mortality or severe complications could be recorded over the years. The median postoperative length of stay was 15 days (SD: 16.4; range: 6–137) with a readmission rate of 18.4% (n = 63). In the whole cohort, clinically relevant POPF occurred in 66 patients (19.3%; type B: 15.2%, type C: 4.1%) and management was interventional in 38 (11.1%) and surgical in 13 (3.8%) cases. PPH was recorded in 17.5% of patients: grade A: 5% (n = 17); grade B: 5.8% (n = 20); grade C: 6.7% (n = 23). Patients experiencing PPH ultimately underwent relaparotomy in the further course in 58.3% of cases, compared to 5.7% of patients without PPH (p < 0.001). DGE occurred in 14.3% of patients: grade A: 6.4% (n = 22); grade B: 3.2% (n = 11); grade C: 4.7% (n = 16). Other common postoperative complications included peripancreatic, intraabdominal fluid collections (n = 122; 35.6%), pleural effusion (n = 77; 22.4%), surgical site infections (n = 46; 13.4%), and ileus (n = 9; 2.6%). One quarter of all patients received postoperative transfusions (n = 84; 24.5%; missing = 37). The FTR rate was 2.2% after occurrence of any complication (5 of 227 patients), 6.7% after PPH (4 of 60) and 1.5% after clinically relevant POPF (1 of 66). Detailed information on the type and severity of morbidity according to the type of resection are presented in Table 3. There were no significant differences between types of resection and overall/severe morbidity as well as 90-day mortality. However, resections other than pancreatoduodenectomy had a considerable higher rate of clinically relevant POPF (p = 0.004) and less frequent pleural effusion (p < 0.001). In terms of management, there was no significant difference between the rate of relaparotomy, median length of stay and readmission rate, but requirement for transfusion was more common after pancreatoduodenectomy and other procedures compared to distal resections. Table 4 shows factors associated with risk for postoperative severe morbidity (including death). The only factor associated with severe complications in both univariable and multivariable analysis was male gender (hazard ratio [HR] 1.92; 95% confidence interval [CI]: 1.09–3.38; p = 0.024). The rate of severe complications was significantly higher in male (27.9%) compared to female patients (16.3%; p = 0.010). Interestingly neither age, nor comorbidities, type of indication or resection, as well as additional procedures like vascular resection or other organ resection were significantly associated with increased rates of severe complications. When evaluating overall morbidity, the only risk factor associated with a higher rate of complications in multivariable analysis was higher BMI (HR 1.12; 95% CI 1.05–1.20; p < 0.001), while distal resections compared to other types of surgery were associated with less morbidity (HR 0.42; 95% CI 0.22–0.82; p = 0.011; detailed data not included). Our cohort displays the typical patients undergoing PR in a tertiary referral hospital, where about 50% of surgical procedures are performed for adenocarcinoma of the pancreas and papilla vateri or distal cholangiocarcinoma as leading pathologies [11, 19, 20]. Other common indications include pancreatic neuroendocrine neoplasms (11%) and IPMNs (9%). In the heterogeneous group of “benign tumours” (22%) a substantial number of precursor lesions (PanINs) is summarized together with lesions of cystic or solid appearance in preoperative workout, often detected in cases of previous pancreatitis, making correct preoperative diagnosis sometimes challenging. In the literature it has been described that about 5% of indications of PR represent a false positive diagnosis leading to unnecessary surgery . Despite not having evaluated this issue in detail in the present analysis, we currently follow a patient-oriented treatment selection process especially regarding cystic neoplasia, which often imply controversies in setting indications for invasive treatment [21, 22]. The current work excluded patients with acute pancreatitis since this entity is nowadays regularly treated by endoscopists and does present with a completely different morbidity rate e.g. in terms of pancreatic fistula and mortality. Nevertheless, we have decided to include resection-type procedures for chronic pancreatitis to get a complete picture of the landscape of pancreatic surgery in our unit. However, this subgroup of patients represents a small number of only 7 cases (2.1%) in 8 years with no mortality and a morbidity rate comparable to the overall cohort (57%). In general, regarding the primary endpoint of this study concerning 90-day morbidity (66%) and mortality (2%) rates, we have shown that outcomes after PR in an Austrian high-volume centre are in line with current internationally published results of well-known expert institutions. A number of previous publications reported that postoperative mortality nowadays remains below 4% after PR when performed in experienced centres . Interestingly, a recent study from Germany suggested that in-hospital mortality following pancreatic surgery is in fact much higher when systematically evaluated on a nationwide level compared to single centre data . In this study, the overall mortality exceeded 10% in one of the most developed health care systems of the world. This clearly shows that retrospective single-centre reports are not necessarily transferable to official national outcome data. Nevertheless, a dramatic difference in mortality has been described in a landmark paper by Birkmeyer et al. when comparing low-volume with high-volume hospitals, with a mortality rate of 16.3% versus 3.8% . The volume of hospitals was defined by criteria established by the Leapfrog Group, which also included several non-surgical categories such as permanent availability of a fully equipped intensive care unit . Regarding number of PR, high-volume hospitals were defined performing at least 11 resections annually . Accordingly, the correct implementation of the Leapfrog criteria would have prevented an estimated 177 deaths from pancreatic resections in 2000 in the United States alone . Despite slow nationwide implementation in Austria, the current trend of worldwide centralisation in specialised pancreatic surgery is also observable in our unit, with a significantly increasing number of PR per year, currently surpassing 70 resections in 2018. In our study, while 90-day mortality with 2% was in the lower range of outcomes reported by others [2, 6], overall morbidity was substantial with 66% of patients experiencing any type of complication. Since two-thirds of these complications were graded mild according to Clavien-Dindo (<3b), the high morbidity rate first and foremost underlines the importance of exact documentation to deliver a realistic clinical outcome picture. In our institution, we have gradually implemented a prospective documentation system within the last years, hereby not only systematically rating complications already during the hospital stay but also listing morbidity including grading (Clavien-Dindo) and management in every individual discharge letter to increase transparency. Besides the obvious scientific value, this also helps with rapid assessment in case of readmission, which was necessary in almost every fourth patient, despite an initial median length of stay of 15 days. Our readmission rate lies within internationally reported numbers ranging between 11 and 53% after PR [27, 28, 29]. Studies confirmed that postoperative complications, like POPF, DGE and wound infections remain the most common cause for readmission [27, 30]. In this study, we did not systematically analyse the reasons for readmission, however sequelae of pancreatic fistula including intraabdominal fluid retention or infection remain the leading causes at our department. Other reasons for readmission were subileus, pancreatic stent issues, development of pseudocysts, colonic fistula, generalized abdominal pain, pseudoaneurysm, infected hematoma and bleeding after drainage removal. In our cohort, severe complications occurred in 22% of patients, congruent to rates of over 20% in the recent literature . One of the most frequent surgical complications at our department was clinically relevant POPF, which was observed in 66 patients (19.3%; type B: 15.2%, type C: 4.1%), ranging within internationally described rates of 10–35% [2, 32]. 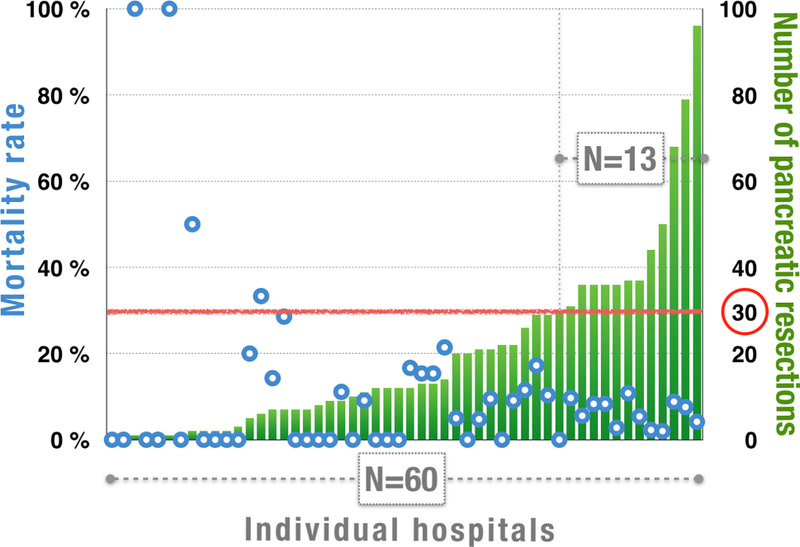 POPF remains a major problem with regard to risk for other complications and increasing healthcare costs for prolonged hospitalization or readmission [33, 34]. The most important risk factors for POPF after distal pancreatectomy described in the literature are: younger age, increased BMI, soft pancreatic parenchyma, diabetes mellitus, disease pathology as well as volume of the pancreatic remnant . Since we have not systematically examined pancreatic parenchyma texture and remnant volume, we have not evaluated risk factors for POPF in this study. A further common complication in our patient cohort was PPH recorded in 17.5% of patients (grade A: 5%; grade B: 5.8%; grade C: 6.7%). This rate is higher to others, describing rates of 7% in high volume centres . Early postoperative bleeding occurs mostly due to technical errors, while late bleedings are often associated with POPF related to arterial origin due to vascular erosion or pseudoaneurysm [2, 37]. Although not evaluated in detail, the rather higher rate of PPH in our institution might be a consequence of previous changes in pancreatic anastomosis technique for PPPD, frequent necessity of vascular resections (12.8%) or extensive lymphadenectomy. In the literature, the described success rate for interventional/non-surgical management of PPH lies around 50% . In our cohort, bleeding necessitated relaparotomy in 58% during the further course, while only 6% of patients without PPH underwent relaparotomy within the same hospital stay. Delayed gastric emptying represents the third typical and frequent complication following PR, occurring in 19–57% . DGE is not only a frequent complication after pancreatoduodenectomy, but it is also seen in distal pancreatectomy. The study from Glowka et al. reported an incidence of 24% for DGE after distal pancreatectomy . In our patient’s cohort, the rate for DGE was 14.3%. Of all complications specific for PR, DGE probably represents the one which is most demanding to be reconstructed from patient records during retrospective analysis. Therefore, DGE rates in our cohort may be underestimated, especially in the early years of this study. In general, DGE causes significantly longer hospital stays, and it seems to be more common after resection for malignant tumours as well as being associated with other major complications . Glowka et al. identified a statistically significant correlation between POPF and DGE. This is in line with our observation were 22.9% of patients with any POPF developed DGE compared to 11.5% without underlying POPF (p = 0.010). Glowka et al. proposed that prevention of pancreatic fistula might reduce the incidence of DGE, particularly in patients with malignancy . FTR has previously been identified as a crucial factor leading to mortality after major surgery including pancreatic resections, especially when several complications accumulate during the postoperative course . In our cohort, despite frequent overall complications, the postoperative mortality was comparably low, resulting in an overall FTR rate of 2.2%. In a recent nationwide time-trend analysis between 2000 and 2011 from the United States of America (USA) a significant decrease in risk-adjusted mortality from 10 to 4% across all hospitals has been recorded. Intriguingly, the authors showed that by increasing the median hospital volume over the past decade, FTR rates were substantially improved, especially in low (15 to 11%) and intermediate volume (11 to 7%) hospitals , while it remained stable with about 6–7% in high-volume hospitals, which were defined as units performing 100 or more pancreatic resections per year. When looking at the latest numbers of annual resections per hospital performed in our country (Fig. 1), further efforts in centralization in Austria are indicated to decrease the current nationwide mortality rates of 7.5% recorded in 2017. Almost 80% of all Austrian departments performing pancreatic surgery achieved less than 30 procedures per year, resulting in an in-hospital mortality of 10% compared to 5.8% in experienced units with 30 or more procedures. Accordingly, in our opinion, the minimum annual number of at least 10 pancreatic procedures per hospital currently proposed in the national healthcare strategy should be increased to at least 30 procedures in order to lower national mortality rates below 5%. In further analyses, we were able to identify male gender as the major risk factor for severe complications, while higher BMI and resections other than distal pancreatectomy were associated with increased overall morbidity. This gender aspect finding is in line with McPhee et al. who observed that male patients had a significantly higher morbidity and mortality rate compared with female patients especially after distal pancreatectomy . However, the main reasons are unclear, especially since in comparable literature, gender differences were reviewed only regarding the overall frequencies of complications without details on types of morbidity and also adjustment for comorbidities or other risk factors was lacking. In summary, clear advances in terms of postoperative management after PR in several centres in Austria including our unit result in mortality comparable to high-volume centres in other countries. However, postoperative morbidity in this field still remains high and failure to-rescue might represent a relevant issue especially in low-volume hospitals. Therefore, further efforts towards centralization but also improvement of prevention and management of POPF and PPH are necessary. These specific complications imply a substantial risk for sequelae, often necessitate relaparotomy or readmission, cause a potentially threatful burden for affected patients and represent a major cause for mortality and healthcare costs after pancreatic surgery. Open access funding for this publication was granted by the Medical University of Innsbruck and the University of Innsbruck. B. Cardini, F. Primavesi, M. Maglione, J. Oberschmied, L. Guschlbauer, S. Gasteiger, S. Kuscher, T. Resch, R. Oberhuber, C. Margreiter, S. Schneeberger, D. Öfner and S. Stättner declare that they have no competing interests.